The first quarter of 2015 is shaping up to be choppy for the three major US global network airlines, driven by currency fluctuation, some overcapacity, and for Delta, a reworking of its hedge scheme in light of lower fuel costs. Those airlines are sticking to previous unit revenue performance estimates for 1Q2015, with the exception of Delta, which has slightly lowered guidance to reflect foreign exchange rate headwinds and the lifting of fuel surcharges in certain international markets. Overall American, Delta and United believe that underlying demand remains strong; but higher capacity in some regions is outstripping that demand, creating some challenges in the short term. American in particular believes the US domestic market should improve in 2016 as the aircraft upgauge undertaken by nearly every domestic airline begins to taper off. Delta Air Lines has refined its 1Q2015 passenger unit revenue targets to down 1% from a previous projection of flat growth, largely driven by foreign exchange rate pressure stemming from the strengthening USD against many major currencies. The airline projects that its international unit revenues will fall 5% year-on-year, with the majority of the decline attributed to the stronger USD. Delta estimates that the drop in international revenues will drive a 1.5ppt decline in overall passenger unit revenues. “A number to put in context is about USD120 million for just the first quarter, that FX headwind on our international revenues,and it's about a $500 million headwind for the full year as we face the year,” Delta president Ed Bastian recently told investors. Delta’s international ASM deployment is the lowest among the three US majors. Data from CAPA and OAG show for the week of 9-Mar-2015 to 15-Mar-2015 that roughly 41% of Delta’s ASMs are deployed into international markets versus 43% for American and 47% for United. US Airways, which is in the process of merging with American, has roughly 22% of its ASMs dedicated to international markets. Mr Bastian did note that declining unit revenues are partially mitigated by lower costs denominated in foreign currencies, “so it offsets about 50% of that revenue decline”. Citing the stronger USD’s impact on fuel prices, Delta’s president believes that the airline strongly benefits from the strength of the USD; “but the math, when you look at RASM compared to CASM is certainly askew”. United is also working to mitigate its exposure to exchange rate pressure. 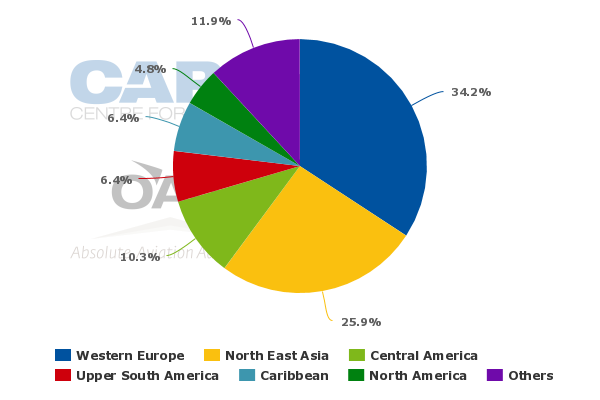 Presently, the airline has the most exposure to the CAD, CFO John Rainey recently told investors. But he explained that the Canadian currency is tied heavily to the oil industry “so there is a natural hedge there”. Mr Rainey said that in the past that United’s has focussed most of its currency hedging on the JPY, but in 2015 the airline is placing more attention on the EUR, and reduced roughly 60% of its exposure to the European currency, “recognising that some are calling for parity between the Euro and the Dollar”. But he also stated that United does incur some expense in those regions where the USD is gaining strength that depresses some of the exposure, and also highlighted the airline’s ability to shift point of sale if necessary. 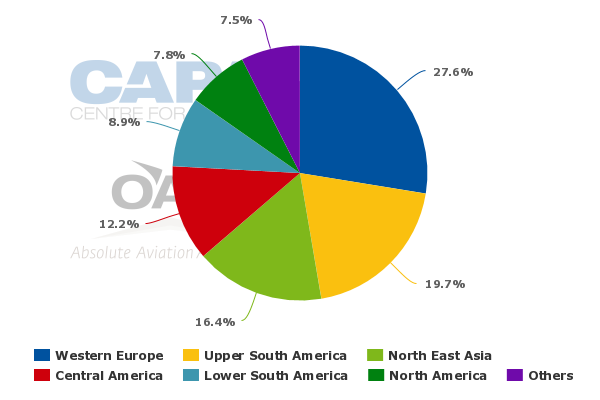 The bulk of United’s international ASMs for the week of 9-Mar-2015 to 15-Mar-2015 are deployed to Western Europe, nearly 30% and North East Asia, approximately 29%. Reiterating previous comments about United’s large presence in Houston, which is heavily dependent on the energy sector, Mr Rainey remarked that reductions in headcount in some energy companies is affecting corporate travel in that sector; however, United benefits much more from the drop in fuel costs. Houston Intercontinental is United’s second largest hub measured by ASMs after New York Newark. American has concluded that US domestic demand remains relatively strong compared with supply, except in markets where significant capacity additions have been made. Most of those markets are new routes that Southwest has introduced from Dallas Love Field after the lifting of the Wright Amendment that restricted certain long haul flights from the airport. Southwest added flights from Love in numerous markets, creating more competitive overlap with American in Dallas/Forth Worth. The added capacity by Southwest and pressure from ULCCs in other markets is driving American’s passenger unit revenues down 2% to 4% in 1Q2015. Airline president Scott Kirby recently told investors that during the first phase of the Wright expansion that capacity in some markets had risen 60% to 70% “and there’s more to come”. However, he believes the Dallas market and the overall domestic market should return to a more normalised state in 2016. But Southwest executives when recently queried about how long promotional pricing would last in the new Love Field markets responded by concluding that usually new markets take about two years to reach maturity, but the new Dallas routes were ramping up quickly. Based on that assessment it seems Southwest may opt to extend promotional fares on the new routes. American’s domestic capacity is forecast to growth 3% in 1H2015 versus industry growth of 5% (excluding American and US Airways). Mr Kirby remarked that he is fielding questions about whether the increase in domestic capacity marks a change in the current airline industry thesis on capacity. He stated that the US domestic growth is driven more by the country’s airlines adding seats to their existing aircraft. All four of the major US airlines – American, Delta, United and Southwest – are in some phase of adding density to their aircraft, with American lagging a bit behind its competitors. Mr Kirby stressed that American, which in late 2015 completed on one of its aircraft modification projects through addition of 10 seats on its Boeing 737-800s, will actually end 2015 with fewer aircraft than at the beginning of the year. United projects that its aircraft gauge will increase 6% year-on-year in 2015 while departures will fall 4%. United’s consolidated capacity growth of 1.5% to 2.5% for 2015 remains intact, with domestic growth projections of 0.5% to 1.5%. Aircraft upgauging is also a major driver in American’s projected 2% to 3% capacity growth in 2015. But Mr Kirby believes that the additional seats that airlines are adding to their aircraft represent basically a one-time event. Although the additional capacity could put pressure on unit revenues in 2015, he suspects 2016 “will look a lot different”. Offering some colour on demand in other regions, Mr Kirby reported that Europe remains strong, but that unit revenues are under pressure due to capacity growth to the region. In Latin America, demand in Brazil is still somewhat weak, but Argentina is improving, he remarked, adding that Bolivia and Uruguay have also been a little weak. Obviously Venezuela still remains challenging for the airline even though it should see some relief from the unit revenue pressure of capacity pull-downs to the country in 2H2015. American estimates its capacity will drop 13% year-on-year to South America during 1H2015 while industry capacity is growing 10%. 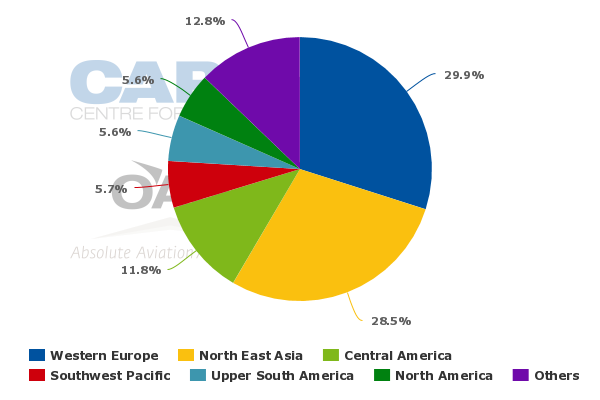 The airline projects its capacity to Asia will jump 34% in 1H2015, with the rest of the industry posting 6% supply growth. Mr Kirby remarked that American is working off a much lower base with respect to its Asian growth. 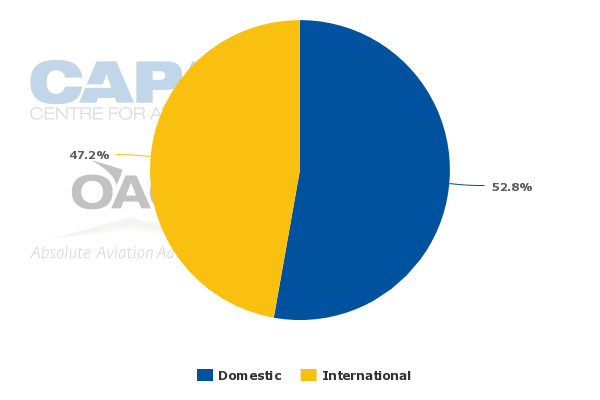 Roughly 16% of American’s international ASMs are deployed to North East Asia (9-Mar-2015 to 15-Mar-2015) compared 26% for Delta and nearly 29% for United (see chart above). Mr Kirby did note that the 6% industry increase in capacity to Asia is likely higher than the growth of economies within the region. Previously, American has stated that if fuel prices remained at early 2015 levels, its Asian routes would be profitable in 2015. Even as oil prices remain drastically lower than a year ago, the pricing volatility has created some challenges for airlines that hedge – American and WestJet are two North American airlines that have given up hedging altogether. 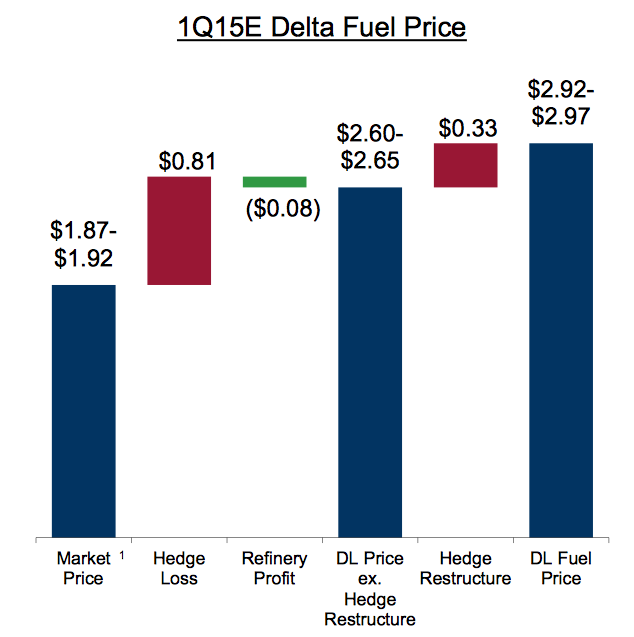 Delta has restructured its hedge book in order to mitigate the sting of the rapidly falling fuel prices that began in late 2014. The airline hedges a portion of its fuel costs six to 12 months in advance of the current year, so the rapid energy price decline have created some major issues for Delta. The airline has opted to settle one-third of its exposure for a USD300 million loss in 1Q2015, and deferred another third of its exposure in 2016 to give the market time to stabilise. Putting all those moving parts together, Delta estimates further hedge losses of between USD200 million and USD300 million during 2H2015. Mr Bastian stated that starting in Jul-2015 Delta will be “paying pretty close to what the industry average is paying in fuel”. United projects hedge losses of USD183 million in 1Q2015 and USD518 million for the remainder of the year. Mr Rainey remarked that while he would like to see fuel settle down a bit, United will still have a hedging programme. However, he believes the airline needs to be thoughtful about “how we go about that”. Mr Rainey stated that during the last few years fuel was “relatively range bound and the curve was backward dated”. The airline would take advantage of the backward dated curve and place hedges further out. If United wanted to do something similar today for 2H2015, the curve is in Contago, said Mr Rainey, roughly USD10 higher. Various challenges in the domestic market and in certain global geographies are creating headwinds for US airlines in 1Q2015, but those companies still remain bullish about their ability to deliver a solid performance during the quarter. But it seems as if some of the challenges of oversupply and currency headwinds will linger beyond the first quarter, which could create more unit revenue pressure than those airlines originally anticipated for the full year 2015. If those headwinds persist, US airlines may find themselves further refining their capacity targets to achieve an optimal supply-demand balance and keep investors satisfied.